This state park is on the northern end of the Big Island along the Hamakua Coast. The entrance to the park is at the end of the Akaka Falls Road, about 4 miles from Honomu. 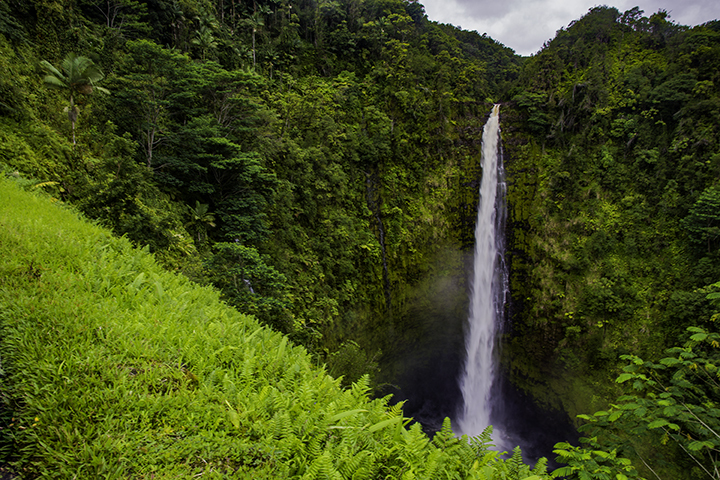 Akaka Falls State Park is open daily with charges of $5 per non-commercial vehicle and $1 per pedestrian. This place is one of the more popular Big Island parks. Verdant forests surround this state park offering hiking paths to multiple waterfalls. 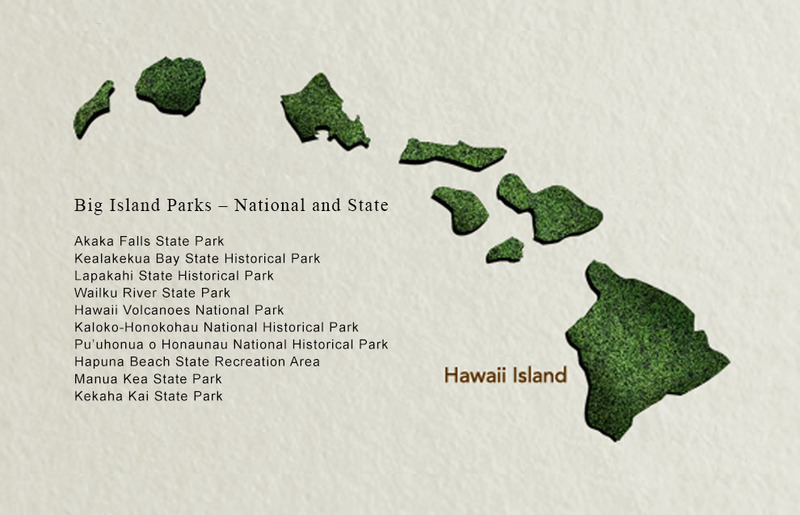 The park has 65 acres of some of Hawaii’s most spectacular landscapes. Hiking is the best way to explore this area of winding paths, leafy plants and unique foliage. 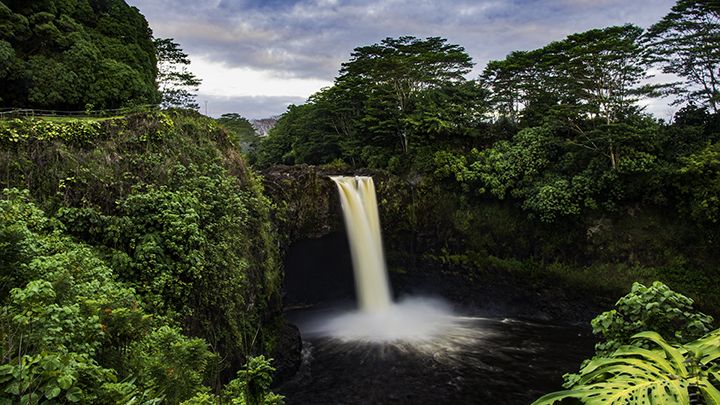 The most popular attractions at park are Akaka Falls and Kahuna Falls. The word “akaka” means split or crack. And its waters seem to do just that, cascading down a jaw-dropping 442 feet. The lookout point at Akaka Falls offer opportunities for capturing Hawaii’s natural beauty on film. The nearby Kahuna Falls plummet 100 feet, creating an ethereal mist over the pool. Many people prefer to hike in Akaka Falls State Park during the morning hours. This is because the sunlight reflecting on the water makes for some beautiful photographs. This place is for day-trip excursions only as there is no camping in this park. However, there are restrooms and drinking water available. This area commemorates one of the first times Hawaiians made contact with the western world. Here, Captain James Cook of England and his ship, HMS Resolution sailed into Kealakekua Bay in 1779. There is a monument where Captain Cook met with native Hawaiians. Initially, the Hawaiians welcomed the foreigners. The Hawaiians believed Cook and his crew were gods. This is because as they came during the Makahiki festival and the Hawaiians believed it fulfilled a prophecy. After they departed, a series of storms sent the ship back to Hawaii in just a few weeks. But when they returned, the Hawaiians treated them poorly. And in a struggle over stolen property, they killed Captain Cook. The monument on the bay’s northern shore commemorates the day of his death. But it is only reachable by foot after a long hike or by sea. Also, there is the Hikiau Heiau nearby. It was a luakini temple, a place where priests made animal and human sacrifices. There is a large stone platform area near the beach, where such sacrifices were performed. It is one of the main attractions in the state park. This state historic park is on the southwestern side of the Island, off Highway 160 on Pu’uhonua Road. It is open daily during sunlit hours and does not have an entrance fee. For nature-lovers who enjoy snorkeling, swimming or hiking, this park offers numerous delights. Tourists will appreciate sightings of Hawaiian spinner dolphins that frequent Kealekekua Bay. This bay is a beautiful place for snorkelers to observe unique fish, such as the humuhumunukunukuapua’a or reef triggerfish. Tourists can rent kayaks, paddleboards, surfboards or body boards here. There are also restrooms, picnic areas and drinking water. Here in this town, the original villagers were mostly fishermen deriving most of their livelihoods from the sea. Visitors can venture on a self guided tour providing insights on life in Hawaii 600 years ago. This state historical park is in North Kohala, about 12 miles north of Kawaihae Harbor. There is no entrance fee to Lapakahi State Historical Park. It is open from 8:00am to 4:00 pm on all days except State holidays. Lapakahi State Historical Park is the site of a Hawaiian settlement covering 262 acres. The waters off the coast are part of the Lapakahi Marine Life Conservation District. Explore a restored authentic hale or Hawaiian hut and lava rock walls. Children and adults alike can learn about the lifestyle, day-to-day activities and games of ancient Hawaiians. While it’s not safe to swim here, the Lapakahi Marine Life Conservation is teeming with fish. There is no drinking water at Lapakahi State Historical Park. But there are restrooms and a visitor information booth here. Wailuku River is one of the smaller parks in the state, extending across 16 acres. It is most famous for the gorgeous 80-foot Rainbow Falls. The mist surrounding the falls creates rainbows in the sunlight. By walking further up the Wailuku River, visitors can see Pe’epe’e Falls and the “Boiling Pots.” The Boiling Pots are ponds that look like bubbling cauldrons during seasons of heavy water flow. It’s within the town of Hilo and is one of the most accessible Big Island parks. Swimming is a popular activity in the lower river of the park. Many also enjoy inner-tubing and wading in the water. However, it’s important to exercise caution here. This is because 25% of drowning incidents in Hawaii occur in the Wailuku River. The word wai means “fresh water” and luku means “destruction.” It’s a most appropriate name. The Wailuku River can rise rapidly during flash floods, even reaching nearby trees on higher grounds. The ideal viewing time for visiting Rainbow Falls is on a cloudless morning. By arriving a few hours after sunrise, you will see rainbows glowing in the light. Photographers will love capturing the arches of vibrant colors above the roaring waters. Hikers will also enjoy the trek to the waterfalls in Wailuku River State Park. This is because the landscapes look like something out of a fairytale. However, all visitors must be careful since trails are often unclear and prone to flash floods. Although park’s beauty is undeniable, you must exercise caution when visiting, especially during floods. 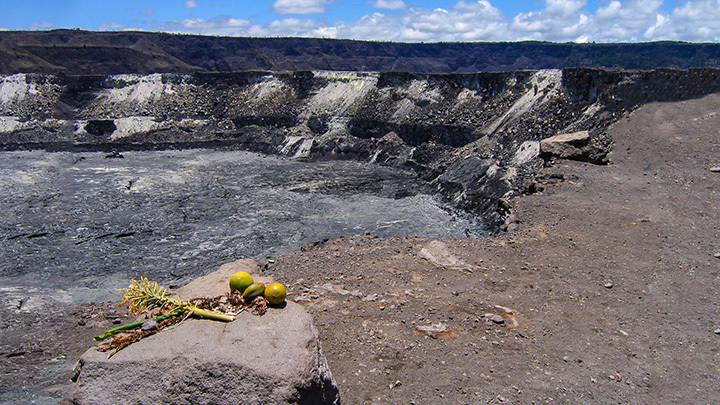 Hawaii Volcanoes National Park features the active volcanoes of Kilauea and Mauna Loa. It is one of the most unique attractions in Hawaii and the most popular of all Big Island parks. Nowhere in the United States can tourists view flowing magma and observe results of lava engulfing homes and roads. Hawaii Volcanoes National Park, is in the central southern part of the island, 30 miles southwest of Hilo. The park covers an enormous expanse of nearly 333,000 acres. The park is open 24 hours a day, 365 days a year. The park offers a variety of terrain. They range from coastal areas to mountainous regions, forests, desert lands and active volcanoes. Kilauea Volcano is the most active volcano on the planet. 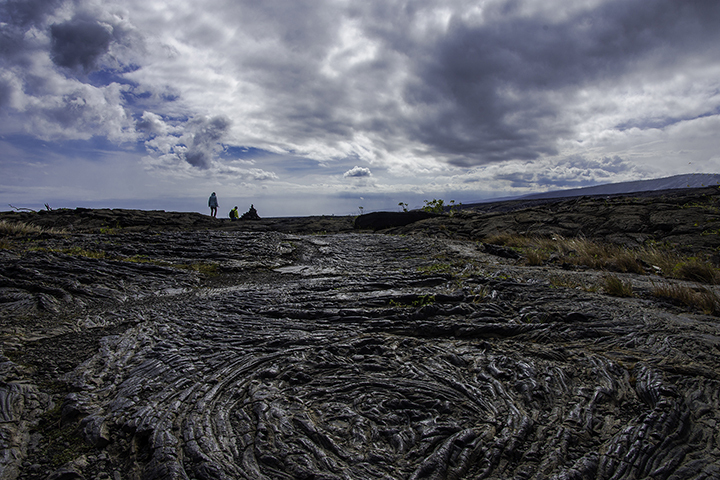 At Hawaii Volcanoes National Park, tourists can often witness its most recent lava flows. Its name, Kilauea, means spewing and has been creating lava flows since 1983. Like all volcanoes in Hawaii, Kilauea is a shield volcano. It produces anywhere from 250,000 to 650,000 cubic yards of lava daily. The continuous flow of magma is changing and expanding the Big Island. Since the recent eruptions began, over 500 acres of land has been added, without any signs of slowing down. Based on its mass and volume, Mauna Loa (meaning long mountain) is the largest volcano on Earth. Its last eruption was in 1984. Mauna Loa’s lava totally destroyed entire towns in 1926 and 1950. Extremely hazardous volcanic gas or volcanic activity can emerge in many places in the park. This is particularly evident along Crater Rim Drive or the Chain of Craters Road. If this is the case, leave the area immediately. So beware whenever the air smells of sulfur or if anyone is has any difficulty breathing. Such gases can be extremely toxic. Visitors should check with park rangers on current volcanic activity and recent warnings. Lava field along the Chain of Craters Road. The drive along the park’s Chain of Craters Road ends where lava literally engulfed the pavement. It is one of the most iconic and stark areas in the park. From a distance, you can see lava flowing into the sea in a fury of hissing steam and smoke. This sight is culturally significant as it represents Pele, the Hawaiian fire goddess, converging with the sea. The Chain of Craters Road is open from 10:00 am to 9:00 pm daily. The Crater Rim Drive is an 11 mile stretch that will take you to park’s other main attractions. These include the: Thurston Lava Tube, Jaggar Museum, Devastation Trail and Halemaumau Crater. West of Crater Rim Drive, the Jagger Museum adjoins an observatory. Here, you can gain insights and scientific knowledge on the volcanoes. Additionally, there are numerous hiking and bike trails within the park. The only hotel in Hawaii Volcanoes National Park is the iconic Volcano House. Here, legends such as Mark Twain have stayed to observe the volcanoes. Volcano House was built in 1846 and has been restored to modern-day elegance, most recently in 2013. Campsites are also available in the park through the Hawaii Volcanoes Lodge Company. You can find the main visitor center at the park entrance. Here, you can obtain brochures, maps and details about the park. This visitor center offers informational films throughout the day from 9:00 am to 4:00 pm. There are also two book stores and a Volcano Art Center Gallery. The Kaloko-Honokohau National Historical Park has a special place in Hawaiian history. Here, travelers can learn how the ancient Hawaiians lived a sustainable lifestyle by fishing and farming. Also, visitors can hike the historic Mamalohoa Trail. The trail grew from a small path in the 1800’s into a road that eventually circled the entire island. They also can trek through part of the Ala Kahakai National Historic Trail which winds past heiaus or temples. This park is on the western coast of the island, 3 miles from Kailua-Kona, south of Keahole Airport. The visitor center is open from 8:30 am to 4:30 pm daily. While the main gate entrance is open from 8:00 am to 5:00 pm daily. There is no entrance fee to this park. Visitors can obtain park information at the Hale Ho’okipa visitor center, north of Honokohau Harbor. The park has fish ponds, heiaus, trails, beaches and the ancient Honokohau settlement. There is no camping at the Kaloko-Honokohau Historical Park at this time. There are numerous things to see and do at Kaloko-Honokohau National Historical Park. Here, one might see Hawaiian stilt or Hawaiian coot birds, honu turtles or monk seals. Vacationers can also venture on scuba diving and snorkeling excursions to view Hawaiian marine life up close. The waters are teeming with varied species from hermit crab to sea cucumbers, urchins and reef fish. You can also see Hawaiian petroglyphs or visit nearby Honokohau Beach. There is no food for sale within the park itself. There are restrooms at different locations in the park, but there is no drinking water. So be sure to bring your own. Pu’uhonua O Honaunau National Historical Park. The Pu’uhonua O Honuanau National Historical Park is where ancient Hawaiian history comes alive. 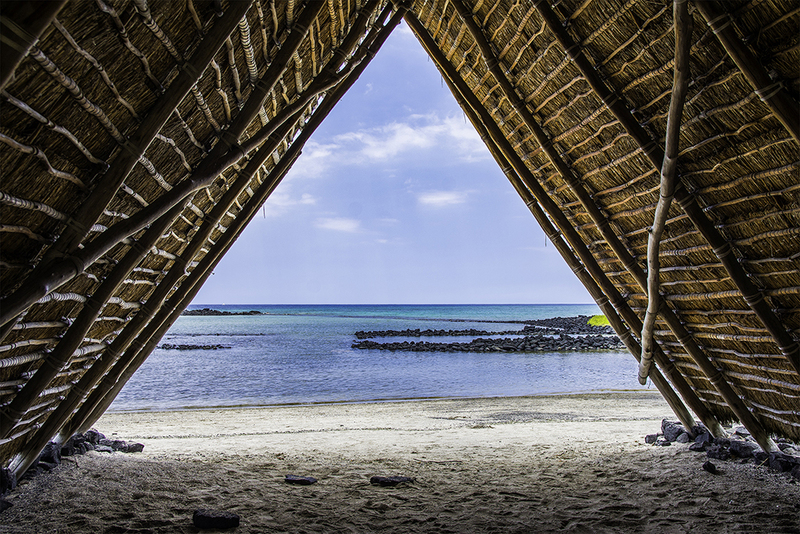 Since becoming a national historical park in 1961, many have visited here to learn about pu’uhonua and kapu. It’s definitely one of the most historic Big Island parks. The kapu system was the ancient Hawaiian code of laws and regulations. If a person was found violating or breaking a kapu, they could suffer instant torture or death. Common people could not approach chiefs or even let their shadows fall on the royal grounds. Women could not eat certain foods, such as bananas or coconuts. Such mistakes were punishable by death. But they could be spared if the guilty one could reach a pu’uhonua before being caught. 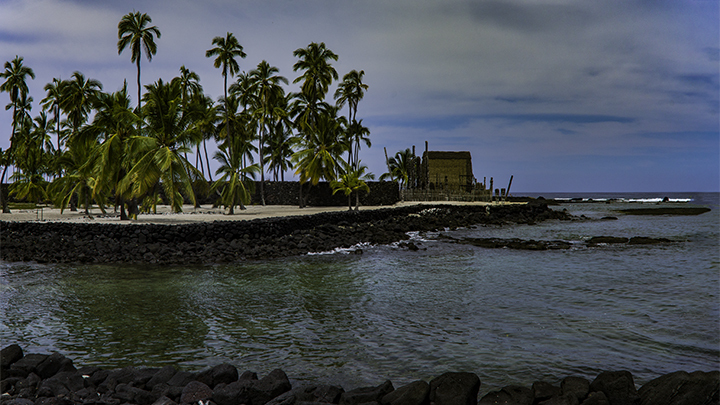 The pu’uhonua was a place of refuge, where a kahuna or priest could pardon the accused. And thereafter, they could go home in peace. The site was also a sanctuary for defeated warriors. Pu’uhonua O Honuanau National Historical Park is on the southern end of the Kona Coast. The park is open at 7:00 am daily, closing 15 minutes after sunset. This pu’uhonua features a number of historically significant sites. There is a visitor center, village, royal grounds, fishponds, trails, heiaus and the pu’uhonua site. It also has scenic coasts and trails of over 180 acres on the Kona Coast. There are picnic areas and places offering scenic views of Keone’ele Cove and Honaunau Bay. Travelers can obtain information about the site at the visitor center. They can also take a self-guided walking tour. Here, you can see the Great Wall of lava rock, which stands 10 feet high and 17 feet thick. Wood statutes of gods and the Great Wall protect the royal grounds and burial sites. Once inside the park, there are numerous demonstrations and hands-on experiences to enjoy. These include watching canoe builders at work, spear throwing competitions and seminar presentations. Throughout the year, there are festivals, performances, games as well as arts and crafts events. Groups can also explore nearby trails for long treks through heiaus and other archeological sites. Food is not available for purchase in the park, so guests will need to bring their own. However, there are picnic tables, grills as well as drinking fountains on site. Pets are allowed at picnic areas, trails and coastal walks, but not at the pu’uhonua or historic areas. Hapuna Beach is on the northwestern side of the island, south of Kawaihae on Queen Ka’ahumanu Highway. It is open daily during sunlight hours with a $5 daily parking fee for out-of-state visitors. This coastal recreation area extends a luxurious 61 acres of stunning white sand beaches and lava rock formations. One of the most beloved and idyllic beaches, the waters of Hapuna Beach have an unearthly aqua glow. Vacationers come to Hapuna to bodysurf, snorkel or sunbathe. However, one should not enter the water when rip currents create unpredictable waves and extreme shore breaks. Visitors can also enjoy picnicking or going on a brief hikes on nearby trails. Travelers can reserve an over-night cabin if they want to extend their stay. There are restrooms, drinking water, payphones here. This park is in the northern end of the island, about 35 miles from downtown Hilo. The park is open daily during sunlight hours with no entrance fee. Mauna Kea State Park is roughly a 20-acre area reaching 6,500 feet in elevation. The park is largely a dry area mountain area offering scenic views of the neighboring Mauna Loa. This park is a prime location for outdoor sports such as hunting wild boar, sheep and birds. It is also an excellent camp site. It has cabins for rent and a well-equipped dining hall. 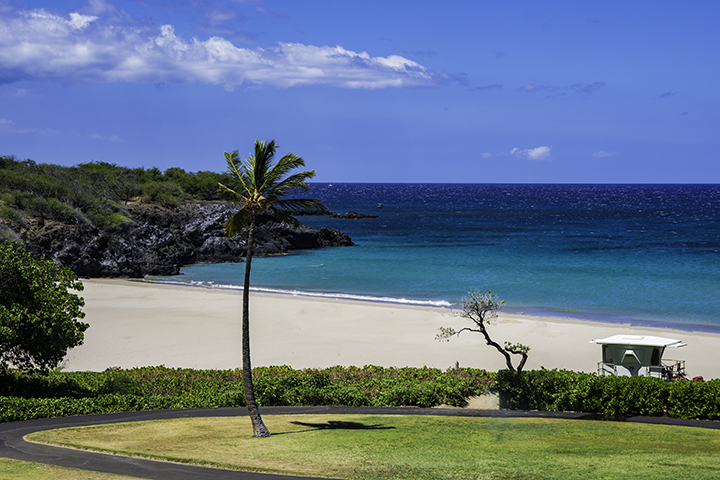 The Kekaha Kai, meaning “the shoreline,” has one of the most spectacular set of beaches on the Big Island. Kua Bay, or Manini’owali Beach, is an excellent place to swim. Its neighbor, Makalawena Beach, is a more private option and is an extremely picturesque place. Here, swimming is heavenly when the waters are calm. Mahai’ula Beach provides a rewarding sight after wandering through a lava field. While Makole’a black sand beach is not suitable for swimming, it is still a definite must-see. This state park is on the furthermost tip on the west side of the island. It is accessible from Queen Ka’ahumanu Highway about 3 miles from the Keahole Airport. The park is open each day from 9:00 am to 7:00 pm. There is no fee to enter the park. 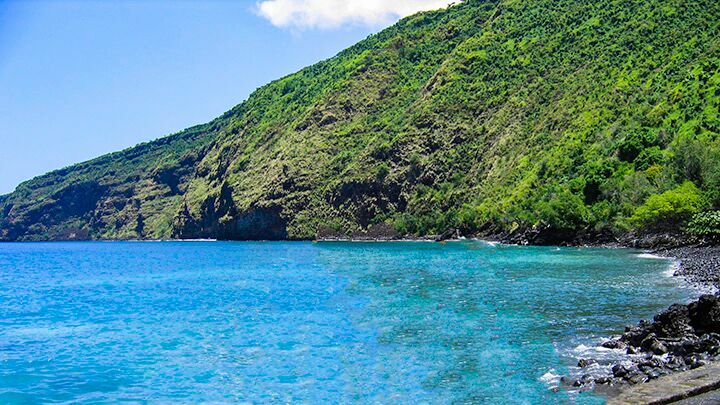 Kekaha Kai State Park covers over 1,600 acres of the Big Island’s famous Kona Coast. Visitors will not regret spending a day lounging on the shores or swimming on these divine beaches. Hiking in Kekaha Kai State Park could be a strenuous way to spend an afternoon. One of the trails extends 8.5 miles with an elevation of 350 feet. When the dusty path is too much for you, take a break and snorkel in the ocean. Visitors can also hike at Pu’u Ku’ili, a cinder cone which offers striking views of the coast. Nearby there is Opae’ula Pond, a national preserve for the Hawaiian silt and Hawaiian coot. They are among Hawaii’s rarest bird species. There is no drinking water in Kekaha Kai State Park. So visitors should bring plenty of their own, as the region tends to be hot and dry.